Sorry, that alliteration was a bit strained. The local fabric shop has my number and gives it out if their customers ask " do you know anyone who . . . "
A lady called a few weeks ago, could I make a replacement cloth for her bedside table? I imagined 12/18 inches square, not much work, so agreed. She turned up with a circular tablecloth, 2m / 6 ft across. 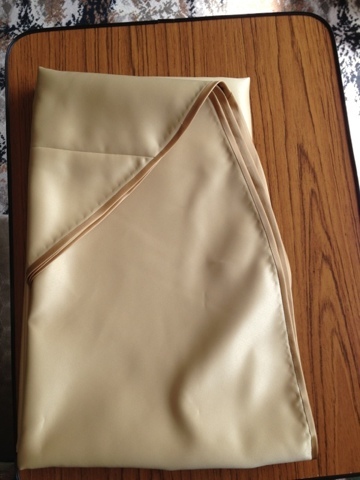 And 4m gold fabric. And 6.5m gold bias binding. It's horrible . . . But it's now finished and collected, and I have a pocket of cash, so (excuse the pun) this cloud had a *gold* lining! Sounds like you earned every last penny of it Benta! I love the gold lining bit:-) well done on doing it! Oh my! It's really hard to work on something you don't like. Looks like it turned out great though. Way to go! Dear lord, you deserve every penny in her bank account for that! !